If you are tired of packing sandwiches for work, try this dish. It whips up in less than 5 minutes. 1) Place tortilla flat on a plate. Add the refried beans on one side of the tortilla. Add a sprinkling of the cheese. Fold up the tortilla, tucking in the edges. 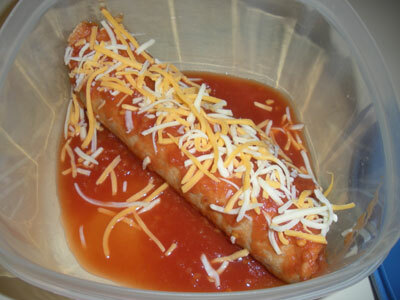 2) Place the enchilada you just made in a plastic container you can take to work. 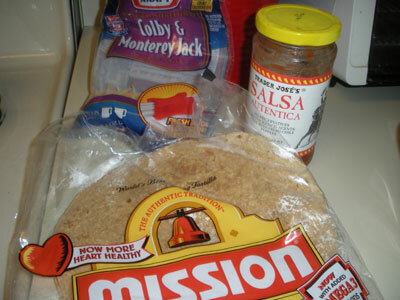 Pour the salsa over it and then sprinkle the remaining cheese on top. 3) When you are ready to eat lunch, put it in the microwave for about 2 ½ minutes or until cheese melts.